It is a land where most of the populationexpress itself through art. “Goa is a land of art and there are around sevenlakh artists in the state,” says Vishnu Surya Wagh, Chairman of Kala Academy. Wagh has plans of expanding thehorizons of art in Goa. “Kala Academy will soon be an institute ofinternational standards. We are currently working on the modalities of theexpansion. We also intend to recruit people who will enhance the knowledge ofart,” he says. Wagh also intends to create more posts at the Kala Academy toaccommodate artists from art centres in rural areas and utilize their talentsin a more organised manner. Wagh is of the opinion that thegovernment should promote Goan festivals in other parts of India to helppropogate the culture of Goa. 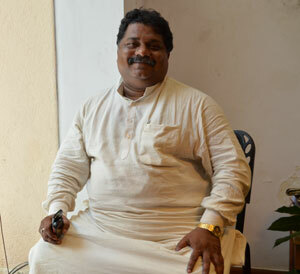 He also says that he plans to construct 10-12Ravindra Bhavans and Kala Mandirs all over Goa. Wagh is also in the process of revivingthe Drama School of Kala Academy, which in the past had registrations from onlytwo to three children. “This year we around 10-12 children, and I will be personallylooking into their training,” he says. On similar lines, Natya Mel, a theatre bodythat organises dramas and plays is being rejuvenated. Five years into hisappointment as chairman, Wagh has been active in reviving various events. GomantRangabhoomi Din, an event in commemoration of Krishnabhatt Bandekar an eminentGoan playwright, was celebrated. Poet Grace Day, Mohd Rafi Day and DeenanathMangueshkar Day were organised in memory of artists who touched many minds withtheir music. A man full of energy and inspiration,Vishnu Surya Wagh is on his way to showing Goan art forms to the world in a newlight.